UPDATED VIDEO: Woman was hit after jumping from motorway bridge near Glasgow. The driver of a bus that hit a woman who had jumped from a motorway bridge near Glasgow has been suspended. The 45-year-old woman was believed to have been hit by the vehicle on the M74 on Saturday night after it left Glasgow's Buchanan Bus Station at 11pm heading for London. The driver continued for 150 miles after the accident. 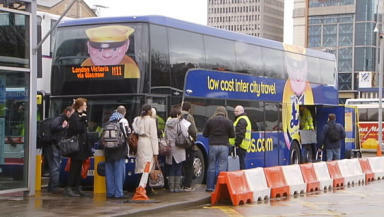 The Megabus service, which was operated by transport company Stagecoach, had begun its journey in Aberdeen and following the accident the driver did not stop the vehicle until its first scheduled stop after Glasgow which was in Preston. The driver was changed and the double-decker continued on to a depot in Rugby, when passengers were transferred to two other vehicles. It is thought that police contacted the driver when it was approaching Rugby. The suspended driver has been offered counselling. One passenger on the bus told STV News that the driver failed to stop even when he was told he had hit someone. John Thompson said: "I said to the driver, 'you've hit a human being there,' but he kept on going. You could hear it being dragged under the bus for a while." Mr Thompson added that the driver had announced over the bus's public address system : "The bus hit a woman outside Glasgow and if we'd stopped, you'd have been at the side of the motorway all night." It has not been established whether the woman, who was lying on the road when she was hit, was killed by being hit by the bus or was already dead before she was run over. Strathclyde Police said that investigations into the death were ongoing. The woman has not been named, and police said that there did not appear to be any suspicious circumstances. Stagecoach, which owns Megabus, confirmed that the driver had been suspended and an investigation launched into the incident. A spokeswoman for the company said: "Safety is our absolute priority and we are taking this incident extremely seriously. We can confirm that the driver of the vehicle has been suspended while the investigation continues into the full circumstances involved. "Our thoughts remain with the family of the woman who has died. Our driver is deeply distressed by the situation and we have offered him the support of a professional counselling service. "We are unable to make any further comment while police are continuing to make inquiries, however we will continue to assist them in any way that we can."